In this latest episode, the boys know how an internal combustion engine works. Let’s learn how it works, and maybe it will be as useful someday to you as it was for them. Not only biologists do dissections. When I was in college, we dissected an internal combustion engine. Not only was it easily as educational as slicing up a frog, but also it had the advantage of not smelling of formaldehyde and not feeling really bad for a frog. Just like dissecting a frog, dissecting a model airplane engine is a terrific way to learn about how the engine (instead of frog) works. But first let’s dissect the phrase itself: “internal combustion engine”. A motor any machine that converts stored energy into useful mechanical motion, or as a physicist would say, work. Even a simple rower with an oar is converting his recent meal into motion of a boat and is a motor. But typically if the device starts with heat energy, as opposed to electricity or other stored power, we specifically call the motor an engine. Another word for burning is combustion. That provides the heat for our engine. A burning log releases heat energy. But fossil fuels such as gasoline and natural gas are able to produce more heat per gram through combustion than nearly any other substance. The only exception is hydrogen, producing three times more energy per gram through combustion than methane or gasoline. Given that the cost of lifting jet fuel is a major expense for flying an airplane, I don’t know why airplanes don’t use hydrogen fuel. Typically the mechanical work is first performed by a fluid, such as steam or a hot gas. When the fluid that is heated is separate from what provides the heat, it is called an external combustion engine. For example, in a steam engine, wood or some material is burned, which in turn heats the steam which is pressed into service. But in an internal combustion engine the same fluid that was burned does the work. The simplicity leads to an economy of parts and efficiency. To make a long story short, if you put a small amount of explosive fuel and air in a small volume and ignite it, a large amount of energy is released as expanding gas. If you are clever enough to do work with this gas, you have built an engine. Such is the role of the piston. When the gas explodes, it pushes the piston and does work. But that’s not the whole story of the piston. The piston and little ports called valves perform a simple dance that performs all the functions of an internal combustion engine. The engine we dissected in college was called a two-stroke engine because it performed all its work in just two steps. But far more common, and used in automobiles, is the four-stroke engine which is even easier to understand. A piston for a Chevy engine. The piston converts the energy of the exploding gas into mechanical energy. Stroke 1: (the “Intake stroke“) The piston pulls back just as the valve opens to a source of fuel and air, usually already mixed just right. The pulling back of the piston fills the cylinder with explosive gas through the hole left by the open valve. Stroke 2: (the “Compression Stroke“) The valve closes and the piston moves forward. This compresses the gas, but more importantly puts the piston in position to be moved outward by the upcoming explosion. Stroke 4: (the “Exhaust Stroke“) A different valve opens so the burned gases can be expelled. This is the exhaust. 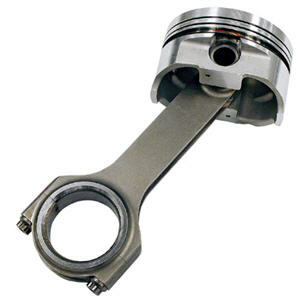 Notice that the piston goes in and out of the cylinder twice, while only producing work once. The process repeats itself thousands of times per minute. 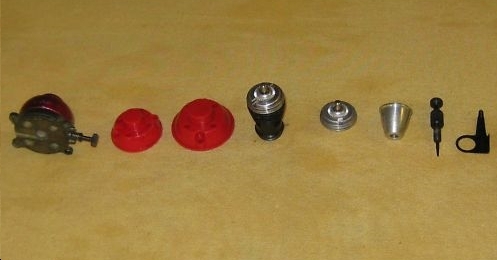 Typically each piston is in a different part of the cycle so that the piston doing the work (expansion stroke) can move the other pistons to do their job on each stroke. The crankshaft turns while the pistons go in and out. Such motion of the pistons is called reciprocating, and often this kind of engine is called a reciprocating engine. It works fine once it is going, but getting it started is the trick. Anyone that has turned on the ignition many times on a winter morning knows how hard this can be. Or you might be faced with pulling the ignition cord on a lawnmower. Any leaks around the piston are bad news. It will cause a loss of compression, perhaps causing Leonard’s problem. Meanwhile oil around the crankshaft can leak into the combustion cylinder and burn, producing smoke and loss of oil. If Leonard’s problem was his car lost too much oil, the damage to the engine means we may not be seeing him drive it ever again. This entry was posted on April 2, 2011 at 5:44 pm and is filed under Uncategorized. You can follow any responses to this entry through the RSS 2.0 feed. Both comments and pings are currently closed. Hydrogen has a higher energy density per unit mass but a lower energy density per unit volume. Hydrogen also needs to be stored at a higher pressure requiring very thick containers. In contrast to conventional fuel, hydrogen can not be stored in the wings of the aircraft. Thus, there is a tradeoff between storing the hydrogen in the fuselage and the lower initial weight. Thus, using hydrogen as a fuel in the commercial aircrafts is still a field of research, though it has been successfully used in small planes. I agree on the frogs! You shouldn’t take apart things you can’t put back together! It’s why I can’t like Bio. Also, don’t give up on that hydrogen storage! We can maybe bond it to some sort of solid carbon thingy! Some guy even saw a new way to spin spirals around: http://www.physorg.com/news/2011-04-advanced-materials-aided-discovery-hidden.html Cool! I want to have a spiral kite! A spiral blimp! Of course, putting a non-flammable, time release hydrogen capsule inside a blimp with a wind turbine is probably silly. Summer is almost here and I’m thinking of kites. I like kites! Leonard’s car will be back. From the symptoms shown on the show it was probably a clog fuel filter or a bad fuel pump. Both easily repaired. It’s too bad Howard the Engineer didn’t know how to debug an automobile. But then again, he’s only got a Masters’ in Engineering. Maybe he wasn’t a broke grad student long enough to be forced by necessity to learn how to fix his scooter? Maybe because the scooter is two-stroke and the car is four-stroke? Automotive engine typically works at about 5000 rpm, which is less than one hundred times per second. BTW, shame on Howard for not even trying to fix the car. I have no actual engineering experience but I fixed my scooter couple of times. Dang! In my head it was minutes, but in my fingers SI units took over. Thanks for that. Recall that Howard can’t fix the elevator either. It only takes being stuck on a Montana highway in the middle of winter once to learn how to fix a fuel filter. 🙂 I have also replaced the alterantor on a ’69 Malibu with an alternator from a GM tractor because I didn’t want to spend my last days on earth frying in an Arizona desert. Necessity is a great auto repair instructor. most engines its half and half..
so for a 4 cylinder engine 2 will be on one stroke and the other 2 will be on another one..
and firing orders are also used to cancel out vibration inherent in any rotating mass…. An explosion is a special and powerful kind of combustion. Basically it burns. Another problem with using an explosive fuel like hydrogen is the enormous speed at which it explodes. Slower combustions are typically more suitable for internal combustion engines. Less stress on the cylinderwalls with the same amount of energy and the addition of power during a longer part of the stroke for a smoother engine for example.